The chart above — there’s a bigger version here — shows the Man U’s share price since the IPO last week. And the weirdest bit of all is actually the first day, when seemingly nothing happened: the stock never moved more than 2% from its IPO price. But as Matt Levine noted that afternoon, after the market closed, the underwriters were clearly supporting the stock at the IPO price of $14, and the volumes being transacted at that level were truly enormous: much bigger than the official greenshoe. Either someone was accumulating an absolutely massive chunk of stock in the open market, or else the underwriters sold an insane quantity of shares at the IPO — almost double the final free float of 16.67 million shares. Neither theory was particularly plausible on its face. Clearly without support, the Man U share price would have dropped below $14. But then something very weird happened when the shares reopened on Monday August 13: after half an hour at $14 per share, they suddenly spiked; at one point that morning they were more than $15 per share. Was Man U stock going up, rather than down? Were the people who bought on the opening day being vindicated? Or was this some weird kind of short squeeze? 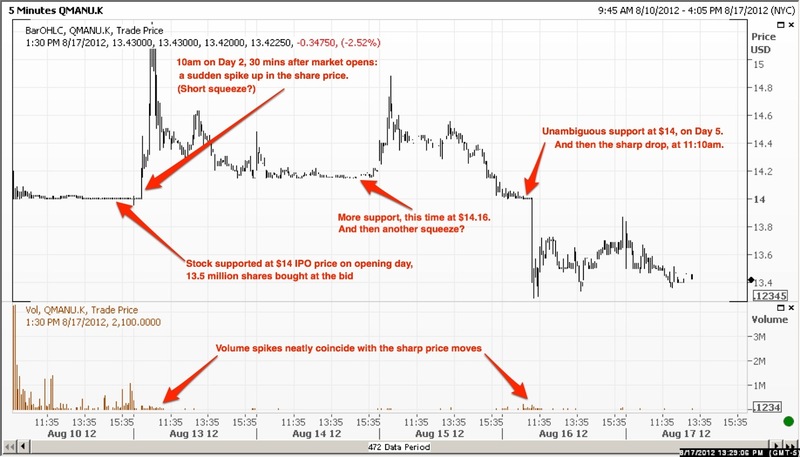 Subsequent price action didn’t help clear anything up. 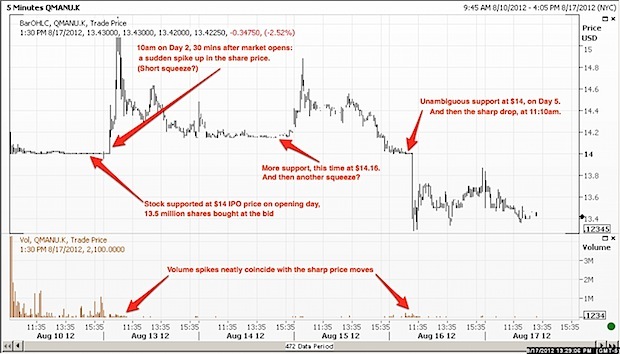 On Day 3, Tuesday, someone was clearly providing support at $14.16 per share. And on Day 4, Wednesday, we had a mini-repeat of what happened on Monday: the stock suddenly spiked upwards for no good reason from its former support level. By the end of the day, however, and on Thursday afternoon, we were back down to the $14 IPO price — and again someone was supporting at that level — until, at 11:10am, they weren’t. At long last, the drop that everybody had expected for Monday morning had finally arrived, and for the time being the stock is floating around somewhere near the $13.40 level. I could try to construct a narrative which might explain all this, but I’d frankly just be making things up. The one thing that I can be pretty sure of is that we’re not seeing price discovery here: this isn’t the natural forces of supply and demand determining how much Man U shares are worth. What it is, however, I have no idea at all. Update: This might explain a lot. IDK, seems there is quite a bit to be ‘discovered’ (meaning – deduced) from the data. Somebody tried at least twice to ignite a rally in this issue, and didn’t get it; after which the effort was apparently abandoned. From this we can safely conclude: there appears to be no lingering appetite for this issue above its IPO price; there appears to be no short squeeze potential here (hardly surprising as it’s an IPO – is there actually an open short-interest at all? ); the stock is down less than 5% from its IPO price after support was apparently withdrawn – FB this is not, at least so far. Somebody appears to have accumulated far more stock in the support-effort than was unloaded when support was withdrawn – most likely that holder is going to want to unload those shares sometime fairly soon. Probably wise to watch this match from the sidelines rather than stepping out onto the pitch. I’d hypothesize that the low float – less than $250 million – and high visibility is a factor in what we’re seeing. Admittedly, that is a description of why the share price could move erratically and not an explanation of what specific trades are moving the price. The book is thin compared to the arrival rate of market orders. It’s all quite normal, the author does not hide the fact he is clueless, I have no idea why this author would be writing a piece on a subject he has no knowledge/experience of. Price exploration is exactly what is happening here. It’s a shame so few people understand how and why liquidity coalesces at a few discrete levels. All the ticks on the price spectrum are not equal. Some are much much deeper than the others.